Yup! 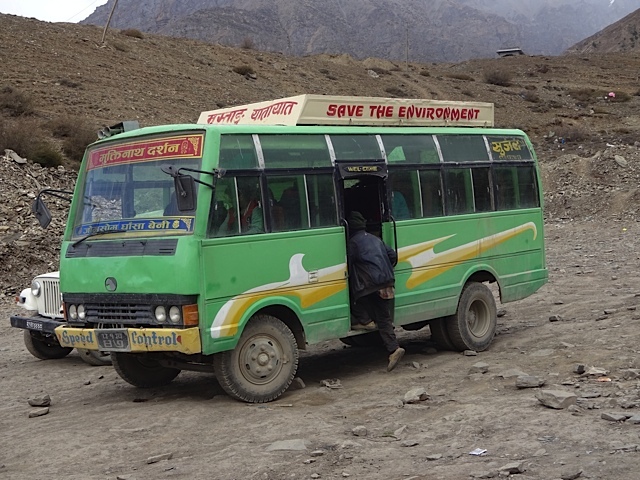 This rattletrap got me down from Muktinath to Kagbeni for the night and I suspect another one just like it will get me down to Marpha tomorrow morning. But that’s only after a teeth-chattering, bone crushing, body-slamming ride down the rockiest, scariest mountain road I’ve ever been on. My main objective was to keep from biting my tongue. I keep saying to myself, “I can’t believe where I am.” “I can’t believe where I am.” Over and over. 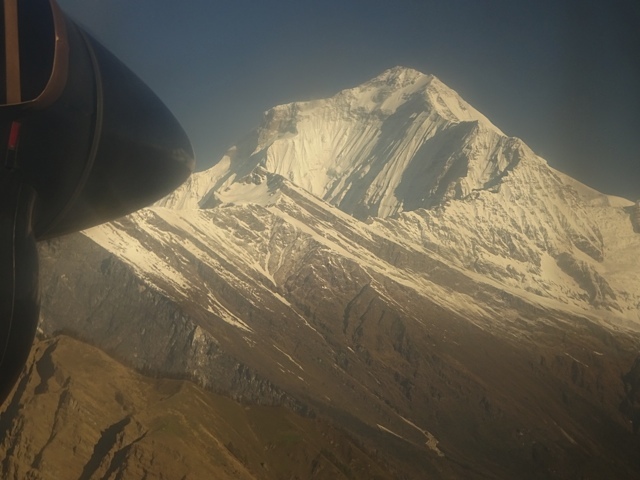 Every time I looked up—in any direction –I am gazing at 6500M + mountains that don’t care whether I’m scared or cold or hungry or need a toilet. 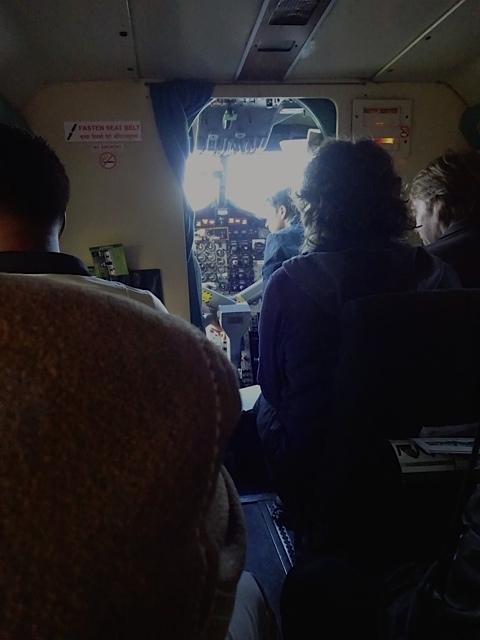 And every time I looked down, I saw a drop of 100, 200, even 300 meters while the bus bounces and careens around corners. And the bus is full. I assume the driver wants to live as much as I do. So really, there’s nothing to be afraid of because I am not in control here. Whatever fear rears its tiny little head, imagining having control or wishing or regretting or wanting, I have to remember that I do not have control any more than one of the 30 other people on this creaky wonder bus. I figure this thing needs shocks about every two weeks. And maybe brakes. My arms are tired from grabbing the seat in front of me. A Nepali version of a wild bull ride. 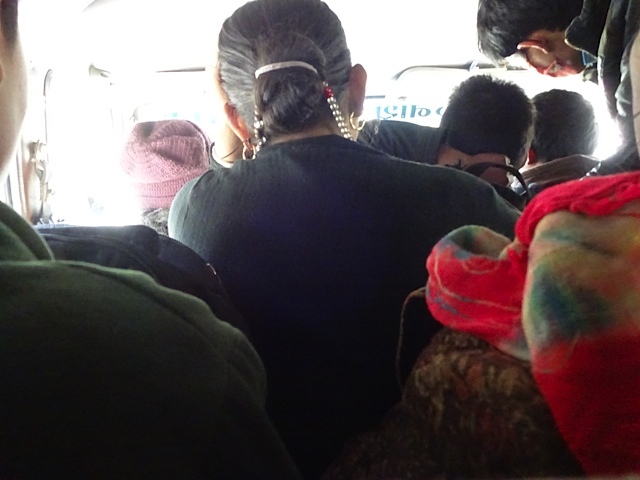 The bus is moving so much in every possible and unpredictable direction that there is no way to even take photos. And anyway, the windows are so dirty, what would be the point? This all started at 4:30 this morning, waking and showering and packing to get out of the hotel at 5 and to the airport for a 20 minute flight to Jomsom. The 6 am departure became 6:30 and it was full. Maybe 15-18 people. And, wow. 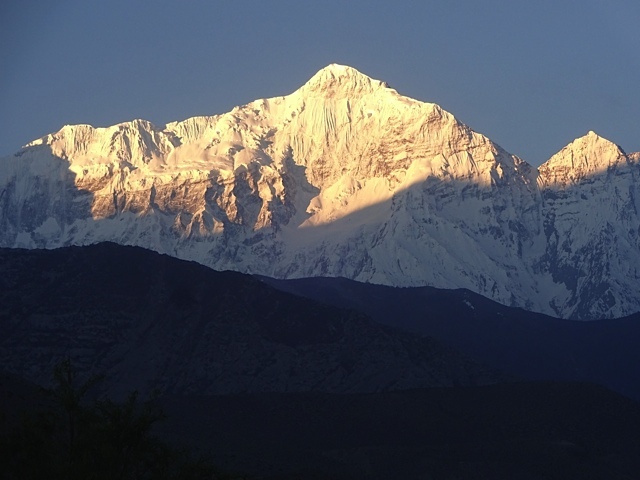 Right up the canyon between the Annapurna Conservation area on the right with a direct view of Machhapuchharhhe (the holy mountain that has never been climbed), and Daulagiri to the west (#7 on the highest mountains list). 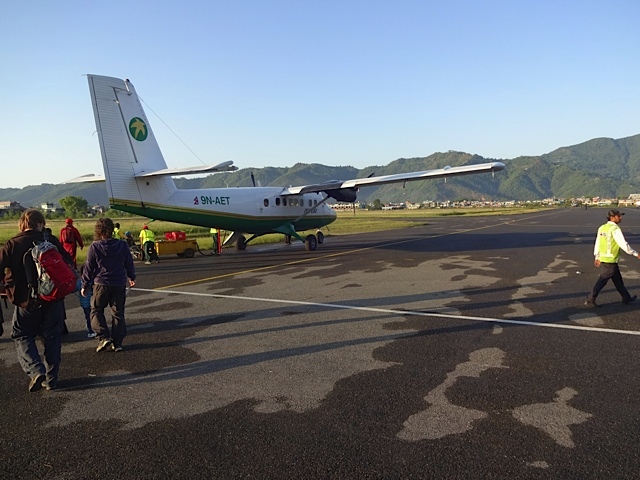 Stepped out of the plane and right into the view of Nilgiri, a 7100M peak. 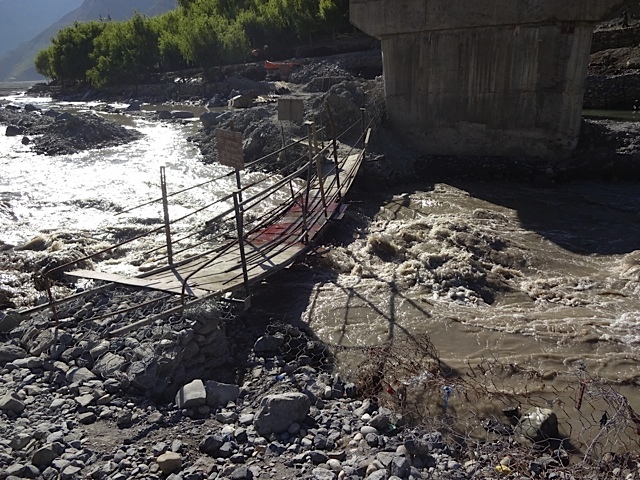 Hiked about 2K to the town and across the river (on a temporary and fragile looking bridge that turned out to be quite solid) to the place where Jeeps and bus transport load up for the ride to Muktinath. 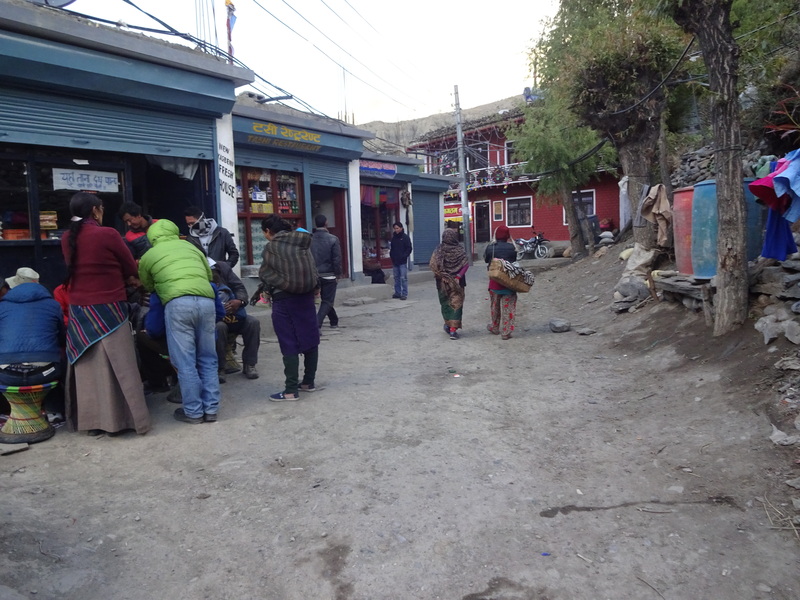 I was originally going to Muktinath to visit the nunnery that is part of the Tsoknyi Nepal Nuns project. There’s also a small gompa there that’s maybe 300 years old. A gorgeous new gompa (temple) was built about 4 years ago. There are usually about 25 nuns there, young and old, teaching staff, cooks, maintenance, etc. Once I got to Gargon Gompa, I spent about three hours with Tenzin Yangchen, a young teacher of English, Tibetan and math from a Tibetan refugee settlement near Marpha, and Ani Kalten, a senior nun, getting the full tour and inspecting quake damage, photographing and taking notes. Also got a great lunch. 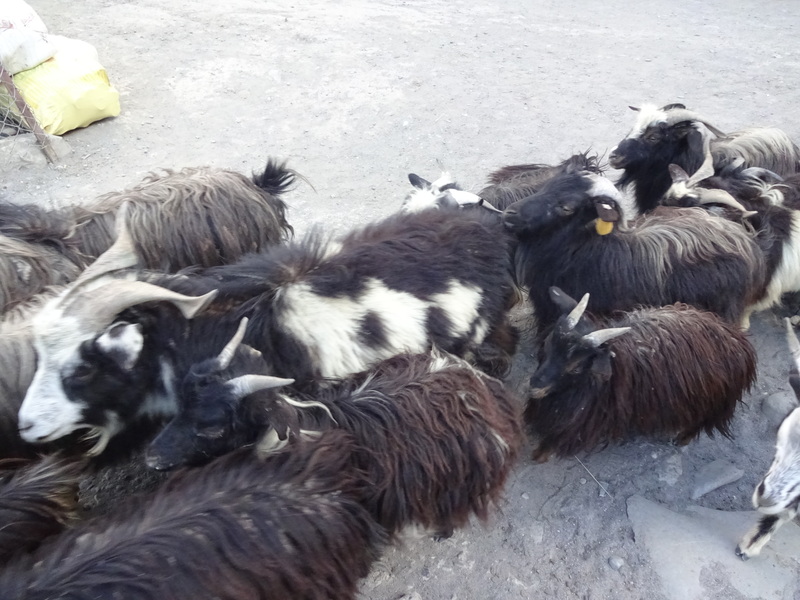 Without a period of adjustment, I had not intended to stay overnight in Muktinath because of the altitude. I felt no ill effects while I was there, but have had moments of slight light-headedness today. But Kagbeni sits down at a more comfortable 2700M. 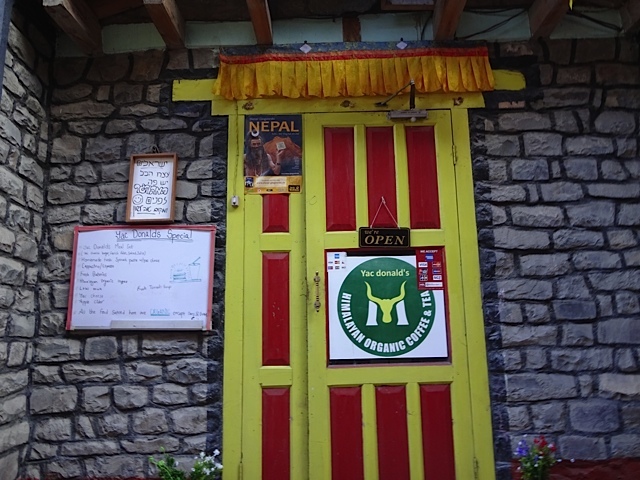 It’s a good deal more appealing than Muktinath, mostly because of the very green terracing surrounding the town, the winding narrow stone paths and the plentiful water flowing here. There are also at least a dozen little hotels and bars, each trying to be the coolest, most appealing to trekkers, advertising rooftop restaurants, hot water and wifi. I’m having dinner at YacDonald’s…. without the beef. 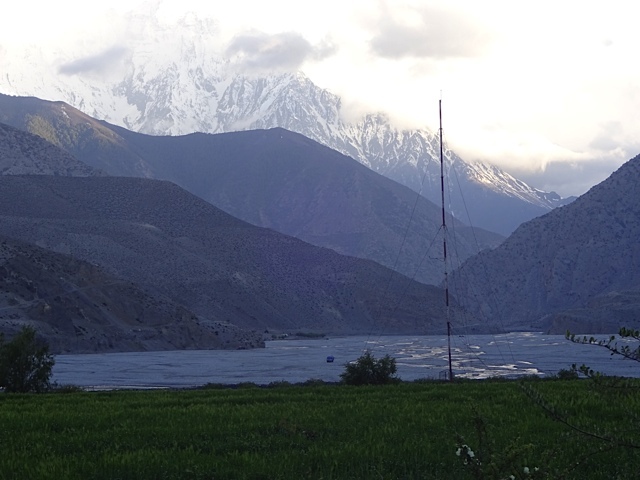 And the entire town sits only 8 km upriver from Jomsom with a direct view of Nilgiri. In fact, I have an unobstructed view directly out my window. There was an unexplained power outage affecting the entire town tonight. Frustrating after a day on the trail, so to speak. Considering when my day started, I settled down early under a cotton comforter. When I woke briefly about three hours later, I looked out the window. The moon was so bright I could clearly see a cloud-free Nilgiri looming over the valley through the darkness. I can’t believe where I am. 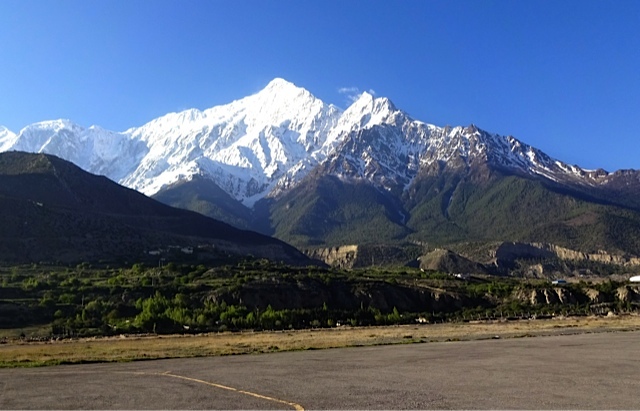 Morning brought another road trip, this time in a jeep from Kagbeni to Jomsom. I got there in plenty of time and had my money ready, but as I suspected, there were more people than there was room. One has to be aggressive in these matters. When we got going, there were 11 people wedged into this Safari-style 4WD. 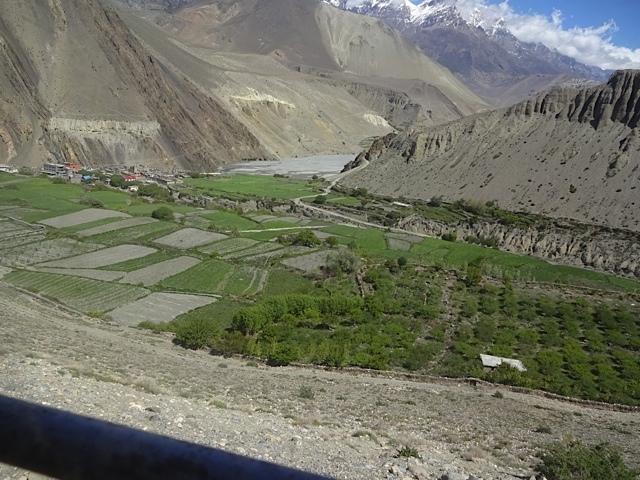 The road from there to Jomsom is not as scary as the road up to Muktinath from Kagbeni, but the driver was going twice as fast and blaring some very unappealing Nepali music with a driving beat. Nevertheless, it was all fine until we got to the walking bridge over the river, where more people were waiting for the jeep. Somehow, we packed in another 5 people. Do Not Ask Me How. I was feeling like a cheap foreigner for allowing a micron to remain between me and the seat in front of me. The driver was sort of sitting on the lap of some kid. And there was another kid sort of standing up in the back seat, holding a rooster. 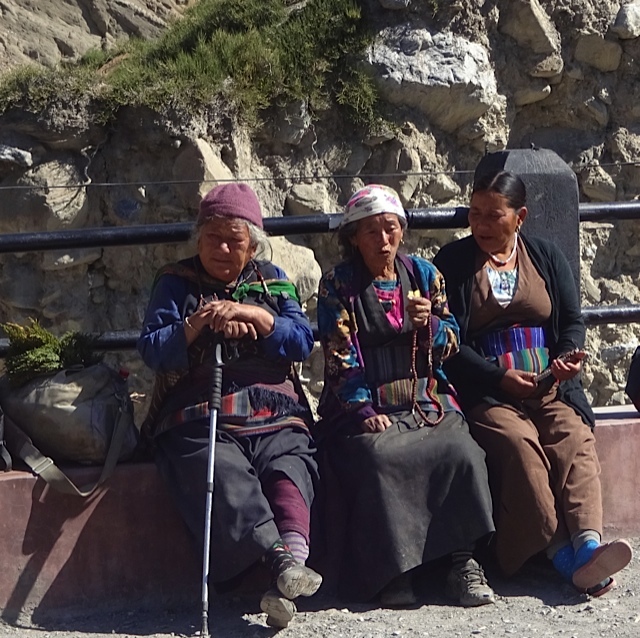 Fortunately, about 2 km later, 5 old ladies got out at a tiny gompa on the river bank at the foot of the mountain. Another couple kids got out shortly, including the rooster. 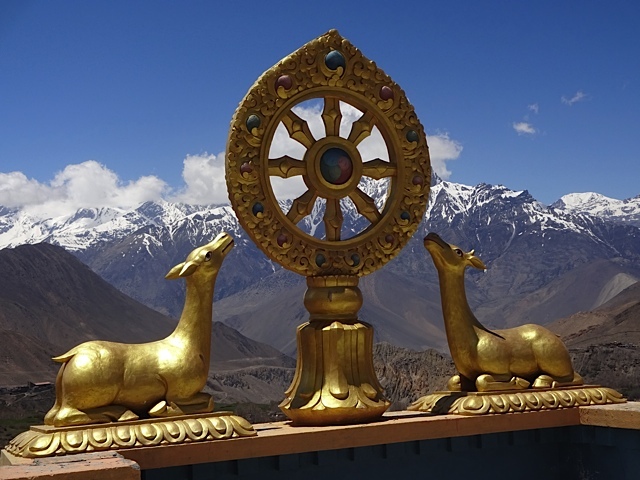 It was scary for awhile, considering how fast the driver was trying to go, until I noticed a solar-powered prayer wheel on the dashboard, turning away. I thought I’d say a few manis myself right then, praying for a higher birth next time so that maybe rides like this, along with my karma, will be a thing of the past. 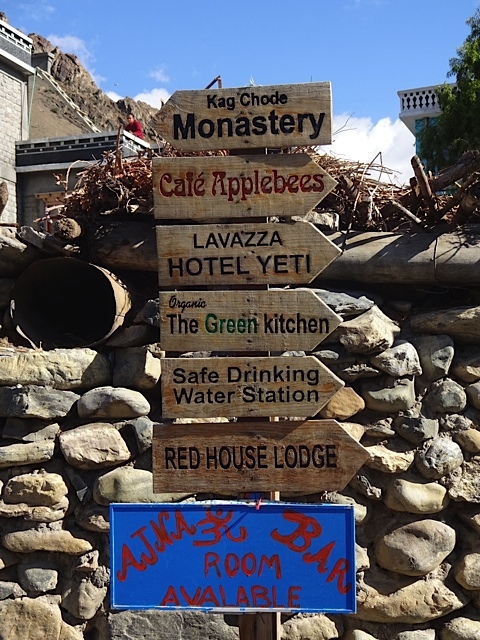 This entry was posted in Nepal, Travel and tagged Gargon Gompa, Jeep to Muktinath, Jomsom, Kagbeni, Machapuchharhhe, Muktinath, Nilgiri, Pokhara airport, Tsoknyi Nepal Nuns Project, YacDonald's hotel by garyhorvitz. Bookmark the permalink. I am keeping up with all your posts and reading all voraciously, appreciating your fearless (and fearful) adventures, political observations with insight, any humor and all images. Just glad you are safe and surviving all that is presented to you on this amazing journey. Thanks, Barb. Happy to hear you’ve been enjoying this. It certainly has been something-everything. Now back to Kathmandu for 3 more weeks. Omg, your vehicular rides are worse than dying and going to hell! Funny. All I can say is the old ladies were working their mala beads the whole time. Actually, it might be uncomfortable, but not scary. Driving? Now that would be scary!